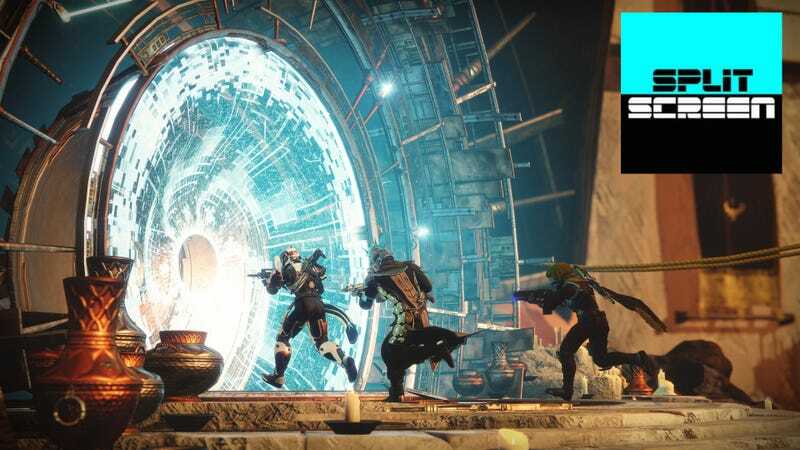 Destiny 2 is a mess right now, as we discuss on today’s episode of Kotaku Splitscreen, but for Kirk and me, worst of all is that we’re not playing together anymore. First, we talk about the news of the week including Mega Man 11 (15:09), Curse of Osiris breaking things, and Xenoblade 2. Then, Kirk and I play a game called Guess The Game Award Nominations (35:38), where we try to figure out which games were selected for the big awards show. Then we get into Skyrim Switch (1:09:09) and the state of Destiny 2, which is... not good. Kirk: I raided last night with this group of guys who were amazing, and we went through the Leviathan raid in a way that I’ve never done before, going through all the back areas between encounters and getting every chest. We did the whole thing in an hour and it was so much fun, it was the most fun I’ve had with Destiny in forever. It reminded me how fun that game is to play with your friends. It’s just the meta-stuff, the stuff outside of the game, that feeling of the over-arching narrative of the game and the expansions and the way Bungie keeps tripping over itself in these little but annoying ways. It really takes a toll on the game overall. Jason: So the problem that you and I have, and I wonder how many other friend groups are having this same problem, is that you really want to play on PC but I don’t have a gaming PC yet so I’m playing on PS4, which is fragmenting us. Because now you and I are just not going to play Destiny 2 together unless you decide to move to PS4 for the next raid or whatever. And that has changed my perspective on it, because I just don’t care enough to keep playing, I just have so many other things to do. So I’m almost completely done with Destiny 2—I’m just not into it anymore. Kirk: I wonder too. I think that’s probably hurt things more than has been really shown. Jason: I dunno. I haven’t really seen other people talking about it. Kirk: I can say that our clan, anyways, it’s an issue where there are people who got excited to play on PC, but it’s not really clear who in the clan is playing on which system. It’s cool that the clan stuff carries over between platforms, but it’s still this feeling of ‘Well, we don’t have everybody.’ And I’m sure we’re not the only ones who’ve had this happen. I went and put in the time, but there’s no denying it does take time. You can level up pretty quickly but you still have to go and play through the whole campaign again, and get your gear again, and the longer you play on PS4, the more you’re giving up to play on PC. I think it’s definitely an issue, it’s a bummer for me. Because the thing last night was a reminder that Destiny is a game you play with people. And if you don’t play with people, it’s a very different game, it’s much less interesting, it’s much less fun. Anything that damages that, and definitely splitting systems and releasing PC late, damages that. It damages the game overall.